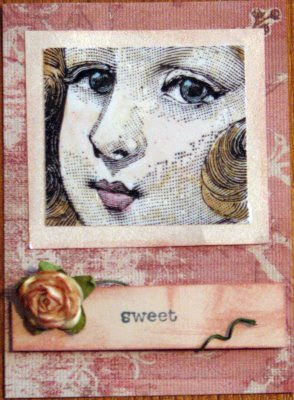 This is an artist trading card that I made for the May art lottery with the stamping e-group, Persnickety. The theme is "children." This is a Magenta Style Art stamp, which used to be part of four vintage faces. I took the rubber stamp off the wood mount and cut up the images so I could use the stamps individually. The image is tinted with Copic Ciao markers. I prefer to stamp my photo image stamps with StazOn black or brown ink onto silk or glossy white stamping paper. I have found that StazOn picks up much more detail in these realistic stamps. However, StazOn ink on glossy or silk paper will smear when using Copic markers. To get around this problem, I embossed the top of the image to seal it. You can now use Copic markers to color the image. As they are alcohol based, they will be permanent -- unless you use the Copic blending pen to move, blend or "erase" the color. When tinting, I used markers directly onto the image, and I also used a spongy eye make up applicator to move and mix colors. lovely ATC Kathy! Great work. I LOVE this card AND what a clever technique to clear emboss on top of Staz On ink to keep it from smearing with the alcohol inks! THANKS for the great tip!!!! Whaat a beautuful ATC, Kathy. I love this stamp.